Luck completed 22 of 31 passes for 239 yards and three touchdowns while also throwing a two-point conversion in Sunday's 42-28 win over Oakland. Analysis: Indianapolis enjoyed a balanced and effective approach on offense, as Luck threw for three scores while the rushing attack produced 222 yards and two touchdowns. He may not be piling up prolific yardage totals -- averaging a respectable 273.4 per game -- but Luck has been a touchdown machine with 23 compared to eight interceptions heading into his Week 9 bye. Luck completed 17 of 23 passes for 156 yards and four touchdowns while rushing for five yards on three carries in Sunday's 37-5 demolition of the Bills. Luck completed 23 of 43 passes for 301 yards, four touchdowns and three interceptions during Sunday's 42-34 loss to the Jets. He added seven yards on two runs. Luck completed 38 of 59 passes for 365 yards with three touchdowns and two interceptions in the Colts' 38-24 loss to the Patriots on Thursday. Luck completed 40 of 62 passes for 464 yards, four touchdowns and a two-point conversion during Sunday's 37-34 loss to Houston. He added 11 yards on the ground and fumbled twice, losing one. Colts head coach Frank Reich said the Colts turning to Jacoby Brissett to throw a 60-yard Hail Mary attempt at the end of Sunday's loss at Philadelphia had nothing to do with Luck's health. "It had nothing to do with that (a fear of hurting his shoulder). It was everything about getting the ball into the end zone," he told Bob Kravitz of WTHR Channel 13 in Indianapolis. Analysis: Both Luck and Reich said that Brissett has a stronger arm, and Reich added Luck would have stayed in the game if the throw was closer. The Hail Mary fell incomplete in the loss. Luck has looked back to full speed so far this season, so fantasy owners shouldn't be worried about him not throwing one long desperation pass. Luck completed 25 of 40 passes for 164 yards and a touchdown during Sunday's 20-16 loss to the Eagles. He added a 33-yard run during the contest. Luck completed 21 of 31 passes for 179 yards, two touchdowns and two interceptions while adding two yards on four carries in Sunday's 21-9 win over Washington. Analysis: Luck hooked up with Eric Ebron for a seven-yard touchdown on the opening drive and added a three-yard score to T.Y. Hilton in the fourth quarter. Hilton was his favorite target throughout, accounting for 83 of Luck's 179 passing yards. While this wasn't an exceptional performance by any means, Luck made the throws he needed to, and, most importantly, didn't seem limited whatsoever by the shoulder injury that forced him to miss all of last season. Luck didn't experience any issues with his throwing shoulder or arm after tossing 53 passes in Sunday's 34-23 loss to the Bengals, Kevin Bowen of 1070 The Fan Indianapolis reports. "I thought that was my best throwing day to date through this whole journey," Luck said Wednesday. "I do feel like [my arm strength] is where it needs to be. I've proven to myself that, especially in practice, that I can make those deeper throws." Luck completed 39 of 53 passes for 319 yards, two touchdowns and an interception in Sunday's 34-23 season-opening loss to the the Bengals. He also rushed once for seven yards. Luck (foot) isn't listed on the Colts' initial injury report for Sunday's season opener against the Bengals. Analysis: Luck injured his foot in the Colts' third preseason game and missed some practice time the following week, but it never seemed like a real threat to his availability for what will be his first regular-season game since 2016. The quarterback will take aim at a Cincinnati defense bringing back most of the key pieces from a unit that limited opposing signal-callers to 6.5 yards per pass attempt and 23 total touchdowns (three rushing) in 2017. 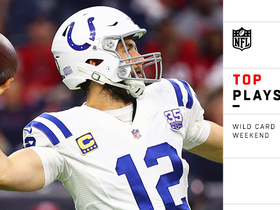 Luck (foot) is on the field Monday for Indianapolis' first practice of the regular season, Andrew Walker of the Colts' official site reports. Luck (foot) has been cleared to resume practicing Monday, Zak Keefer of The Indianapolis Star reports. Analysis: Luck has been held out of practice this week while resting a minor foot injury that he was able to play through in the Colts' third preseason game. He completed 20 of 32 passes for 204 yard with a touchdown and an interception in three preseason appearances, and he'll now have a full week to prepare for the Sept. 9 season opener at home against Cincinnati. There hasn't been much mention of Luck's surgically repaired shoulder since the start of training camp. In reference to Luck's minor foot injury, coach Frank Reich noted Tuesday that the QB is "doing well. He'll be there Monday ready to go for next week," Zak Keefer of The Indianapolis Star reports. Analysis: The Colts have nothing to gain by exposing Luck to unnecessary contact in Thursday's preseason finale, but he'll evidently be ready to go next week once the team begins its preparations for Week 1. Luck (foot) isn't practicing Tuesday, Zak Keefer of The Indianapolis Star reports. Analysis: Despite playing through the foot injury in Saturday's preseason win over San Francisco, the 28-year-old quarterback is now missing back-to-back days of practice. Coach Frank Reich said Monday that Luck would be fine to play if the team had a regular-season game this weekend. A cautious approach makes sense as the team gears up for a Week 1 home matchup against the Bengals on Sept. 9. Luck was held out of Monday's practice with a minor foot injury, Stephen Holder of The Athletic Indiana reports. Analysis: Luck stayed in Saturday's preseason win over the 49ers after suffering the injury, and coach Frank Reich said the quarterback could return to practice as soon as Tuesday. 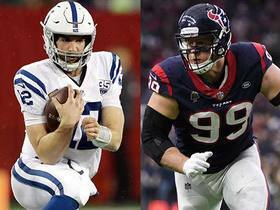 Reich also mentioned that Luck would be fine to play this week if the Colts had a regular-season game, per Mike Chappell of Fox 59 News Indianapolis. Even if he ends up missing a couple days of practice, Luck should be healthy for a Week 1 home game against the Bengals. Luck completed eight of 10 pass attempts for 90 yards and a touchdown during Saturday's preseason game against the 49ers. He also carried four times for 27 yards. Luck and most of the Colts' healthy starters could play deep into the second quarter of Saturday's preseason game against the 49ers, Mike Chappell of Fox 59 News Indianapolis reports. Luck completed six of 13 attempts for 50 yards and an interception in Monday night's 20-19 loss to the Ravens in the second preseason game. Analysis: Luck was also sacked twice. The quarterback forced a red-zone interception along the sideline on his second series, but was sharper his next time out, finding tight end Jack Doyle for a couple of completions en route to a field goal. Overall, Luck featured for five drives, continuing to rebuild his comfort level in live action. The Colts plan to have Luck play more in the second preseason game Monday against Baltimore than the two series he played in the first preseason game, Mike Wells of ESPN.com reports. Analysis: Luck played his first game since the 2016 season in the first week of the preseaon and looked in mid-season form by going 6-of-9 for 64 yards with no turnovers. It sounds like he'll get more work in the second game, but we wouldn't be surprised if he's held out the final two games if continues to do well. Luck was 6-for-9 passing for 64 yards with no touchdowns or interceptions and led the Colts to field goals on both of his two series at quarterback in Thursday's preseason game against Seattle. It was Luck's first game since the last game of the 2016 regular season on Jan. 1, 2017. Analysis: Luck looked sharp during his two drives and also took a hit and was sacked, but bounced back up. He has checked off every box so far this summer in his return from a shoulder injury that caused him to miss the 2017 season. He may not need to prove much else during the preseason that he'll be ready for Week 1 of the regular season. Luck is slated to see around a quarter of work with the Colts' starters in Thursday's preseason opener, Kevin Bowen of 1070thefan reports. Analysis: That should result in Luck getting in about two or three drives, which limits his upside in DFS formats. More importantly though, the QB will be seeing his first game action since Jan. 1, 2017, which represents a major step in Luck's continuing recovery from his (previously) lingering shoulder injury. Luck (shoulder) was 19-for-22 for two touchdowns and no interceptions in Sunday's practice, and he's "responding well" to the increased workload that has seen him throw in three of the first four days of training camp, the Indianapolis Star reports. Analysis: Luck looked back to his pre-injury form with several long completions to T.Y.Hilton. 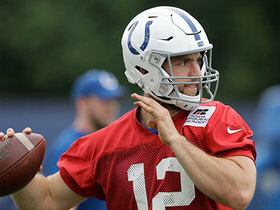 Other than getting a scheduled day off from throwing Saturday, Luck has done everything at full speed in training camp and is expected to play in the team's first preseason game. 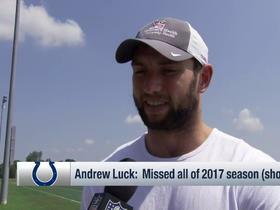 He still needs to show his shoulder can hold up from playing in games and the rigors of practice, but Luck so far looks set to return for Week 1 after missing all of 2017 after surgery for a torn labrum. 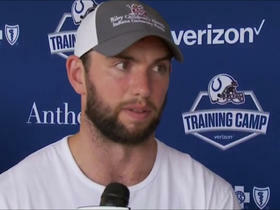 Luck (shoulder) practiced fully Thursday, Kevin Bowen of 1070 The Fan Indianapolis reports. Analysis: Given that it was his first full workout in nearly 19 months, it's not surprising that there was a degree of rust to be seen, but overall, coach Frank Reich was pleased with what saw from his franchise QB. "I thought he looked strong, consistent." Reich said of Luck on Thursday. "It was a good first day for him." Looking ahead, Luck is slated to practice again Friday, before sitting out the team portion of Saturday's session for maintenance purposes. Luck is scheduled to play in the Colts' first preseason game Aug. 9 against the Seahawks, Zak Keefer of The Indianapolis Star reports. Though Luck (shoulder) will work without limitations in training camp, he'll mimic a regular-season practice schedule that includes routine days off, Kevin Bowen of 1070 The Fan Indianapolis reports. General manager Chris Ballard said Friday that Luck (shoulder) will be given regular days off during training camp, but the quarterback won't be under any limitations when he's on the field, Kevin Bowen of 1070 The Fan Indianapolis reports. 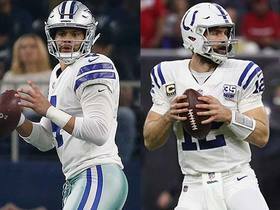 Luck (shoulder) has experienced no pain in his throwing shoulder since he resumed throwing footballs, Zak Keefer of the Indianapolis Star reports. Although Tuesday marked the first time Luck (shoulder) threw a football in public, he indicated after practice that he had been throwing a football for the last two weeks, George Bremer of The Anderson Herald Bulletin reports. He also said after practice that he will "absolutely" play in Week 1 against the Bengals, Mike Wells of ESPN.com reports. 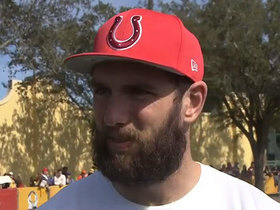 Luck (shoulder) was throwing passes with a football in practice Tuesday, Mike Wells of ESPN.com reports. It's the first time he's thrown a football since October 2017. 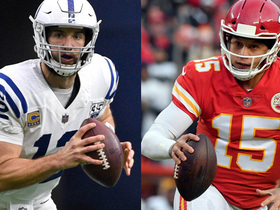 Analysis: Luck made some progress during minicamp in late April by taking some snaps and handing the ball off, but this is a significant benchmark. He missed all of the 2017 campaign because of the shoulder injury after posting an impressive 31:13 TD:INT ratio in his fifth year under center for the Colts back in 2016. We'll need to see how his shoulder responds from throwing again, but it's now a lot easier to envision Luck under center for the Colts in 2018. Colts head coach Frank Reich said Thursday that Luck (shoulder) is getting "real close" to throwing a football, Adam Schefter of ESPN reports. Colts head coach Frank Reich said Wednesday that he anticipates Luck (shoulder) throwing during the break between the end of minicamp and the beginning of training camp, Andrew Walker of the Colts' official site reports. Luck (right shoulder) took snaps and executed handoffs during Tuesday's minicamp practice, Andrew Walker of the Colts' official site reports. Luck (shoulder) revealed Monday that he still hasn't progressed to throwing a regulation NFL football, Mike Chappell of Fox 59 News reports. Luck (shoulder) has progressed to throwing footballs as part of his rehab work, Stephen Holder of The Indianapolis Star reports. Colts owner Jim Irsay said Monday that he believes Luck (shoulder) has "turned the corner" in his rehab process, Mike Chappell of CBS4 Indy reports. "All indicators are (the) healing is going really well and we feel really optimistic that he's turned the corner and has a full decade ahead of him of excellence,'' Irsay said. Luck (shoulder) "is expected back in the building in Indianapolis this week for a checkup," according to Ian Rapoport of NFL Network. "Everything is positive here and at this point, I know we heard this last year, but the Colts do expect him to be ready for training camp," Rapoport added. General manager Chris Ballard is confident that Luck (shoulder), who is set to report to the Colts' offseason program April 2, will be under center for Week 1 of the regular season, Zak Keefer of the Indy Star reports. "Do I have any doubt that he's going to be ready?" Ballard asked Wednesday. "No, I don't." Colts head coach Frank Reich said Wednesday that Luck (shoulder) hasn't resumed throwing a football yet, but is "checking every box" in his recovery and will join the Colts on April 2 for the start of the team's offseason program, Dan Graziano of ESPN.com reports. Updating a previous report, Luck (shoulder) has resumed throwing weighted balls rather than a football, Ian Rapoport of NFL Network reports. Luck (shoulder) has started throwing a football and doesn't believe he'll need another surgery, the Indianapolis Star reports. "That ship has sailed in my mind, which is also a bit of relief now, if I'm not going to lie," Luck said of the possibility of another surgery on his shoulder. Colts head coach Frank Reich said last week that Luck (shoulder) has yet to begin a throwing program, Kevin Bowen of 1070 The Fan Indianapolis reports. Colts general manager Chris Ballard addressed Luck's rehab during a press conference Wednesday and downplayed speculation that the health of the quarterback's right shoulder played a role in Patriots offensive coordinator Josh McDaniels' decision to withdraw his acceptance of Indianapolis' head-coaching vacancy, Kevin Patra of NFL.com reports. "Let's talk about Andrew because there's a lot of rumors," Ballard said. "I'm going to listen to the doctors that he's talking to and dealing with, and I'm going to listen to the guy that is training him right now. And, at this point, we feel very strongly that Andrew's in a good place. He doesn't need surgery -- I have not gotten that from the two doctors that he's seen after the season. His strength is good. He's working on his throw motion and he's working on his arm speed right now. He has not picked up a football, but he's throwing balls, working on arm speed. He's not going to skip a step...he's going to do everything right to get himself ready to play. And I'm very confident -- he's very confident -- that he's going to come back and prove a lot of people wrong." 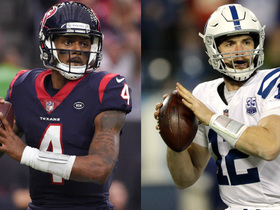 Luck (shoulder) is "very close" to receive clearance to throw again and will soon travel to Los Angeles to work with throwing mechanics and strength gurus Tom House and Adam Dedeaux, Ian Rapoport of NFL Network reports. 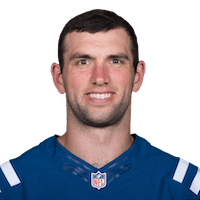 Luck (shoulder) has returned from spending six weeks in the Netherlands working with a trainer but said he did not receive any injections or special treatment, Mike Wells of ESPN.com reports. 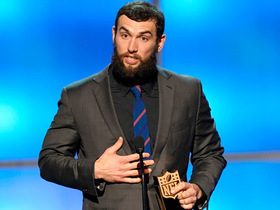 "I plan on being ready for everything, everything official, offseason, NFL schedule," Luck said. "I plan on being ready." Analysis: Luck said he was doing "rehab, strength training, soft tissue work" with a trainer in Europe and left the U.S. to focus on his rehab. He'll start throwing again next month, but he and the team have not ruled out surgery if he's still experiencing pain. Luck, who had shoulder surgery in January, hasn't thrown since being shut down in late October. He has had similar optimism over the past year, so we may not know his 2018 status until he begins throwing and participating in offseason workouts. Colts head coach Chuck Pagano said he expects Luck (shoulder) to report to the team's facility this week, Kevin Bowen of 1070 The Fan Indianapolis reports. When Luck (shoulder) returns from his treatments in Europe next week, he'll resume a throwing regimen that will ultimately determine whether he needs corrective surgery to his biceps tendon, Chris Mortensen of ESPN reports. Such a procedure would likely require a 3-to-6 month recovery timetable. Analysis: A decision on further surgery could be made by mid-January. This report contradicts recent statements from Colts owner Jim Irsay, who said last week that Luck won't require an additional procedure during the offseason. Luck hasn't practiced with full contact since undergoing surgery last January to address a torn labrum in his throwing shoulder. It sounds like Luck's status for the 2018 season will continue to be uncertain throughout the offseason. Colts owner Jim Irsay said Luck (shoulder) won't require an additional procedure during the offseason and will return to the field in 2018, Ian Rapoport of NFL Network reports. "He's doing great," Irsay said, in reference to Luck's response to rehab and treatment. "He's doing well. [We're] disappointed obviously it's taken as long as it's taken. You know, medicine and the way it goes. But there hasn't been any unusual setback. We didn't find out anything ominous, something we didn't know about or anything like that. It's just taken time for him to go through his whole aspect of rehabbing and progressing and working through the soreness." Luck traveled to Europe to receive additional treatment on his surgically repaired right shoulder, Mike Wells and Chris Mortensen of ESPN reports. Luck, who the Colts placed on season-ending injured reserve Thursday, recently met with doctors, who recommended the quarterback shut down his throwing program for around 1-to-3 months, Ian Rapoport of NFL Network reports. The Colts will place Luck (shoulder) on injured reserve Thursday. Analysis: As a result, Luck won't practice or play again for the rest of the 2017 season, with the Colts' franchise quarterback noting Thursday that he's "very optimistic" about his future. In Luck's continued absence, Jacoby Brissett will remain the Colts' starting signal caller.